Welcome to Golobcek BedΠzza Hostel. 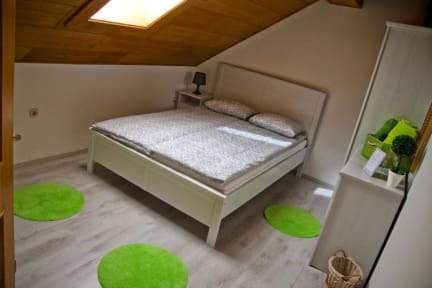 Where you can sleep in brand new rooms and eat one of the best traditional Italian pizza in Slovenia. Vransko is a small town, 40Km from our capital Ljubljana. There are five rooms in our property which have common place with coffee machine in it and a terrace. 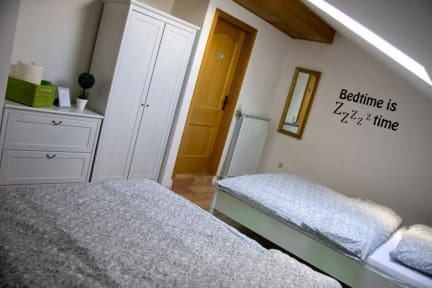 Each room has its own bathroom with shower or bath, TV and free Wi-Fi connection. Two of our rooms have balcony. A parking place is organized for cars, motorbikes and bikes. You are allowed to bring your pet in our property. Downstairs is our Pizzeria where we make one of the best traditional Italian pizza in Slovenia. You can eat more than 20 different pizzas. There is also a beautiful garden opened in summer time where you can enjoy a quite afternoon drink. Beside the polygon there is also a restaurant, three conference rooms and a garage. Over 100 motorcycles are in exhibit, from world famous makes to rare and precious examples from the twenties, like the Indian Scout and the Ner-a-Car. This is a natural climbing wall on Čreta. This is an ideal place for climbing on hot summer days, because it is situated among trees. There are 18 different cycling routes in the Lower Savinja Valley.